After a wild week in global financial markets, stock prices struggled at times on Friday to get a firm footing—trying to find a bottom from which it can build some upward momentum. Analysts suggest that we might be in for more volatility than we have become accustomed to, and we have certainly seen that in recent trading days. As of Friday’s close, the Dow Jones Industrial Average is down 9.1 percent from the all-time high set on January 26. However, to be fair, it remains 32.0 percent higher than it was on Election Day in 2016. Still, one could easily make the case that a correction was overdue. In the case of the current market, it could also be said that the decline stems more from optimism, and not pessimism, about the economic outlook. Strong economic growth, including job gains and wage pressures, combined to send a signal to financial markets that the Federal Reserve might be more hawkish on rates than some might have predicted, and that was enough to send equity markets sharply lower. Despite the stock market fluctuations of the past week, the fundamentals of the worldwide economy remain quite healthy, and more importantly, the outlook continues to be strong. U.S.-manufactured goods exports rebounded strongly in 2017—a nice turnaround after global economic weaknesses in both 2015 and 2016. 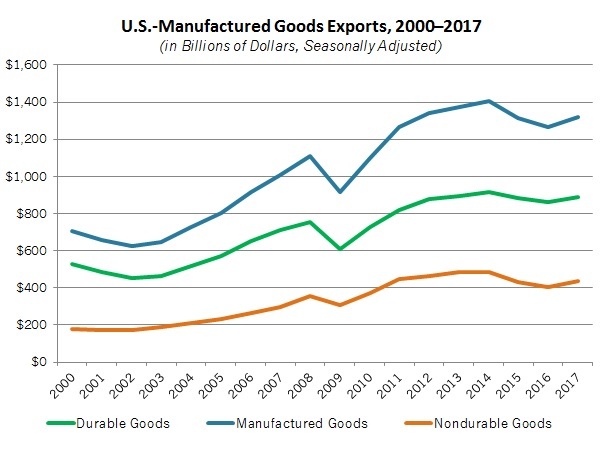 According to new seasonally adjusted data from Trade Stats Express, U.S.-manufactured goods exports totaled $1.32 trillion in 2017, up 4.7 percent from $1.26 trillion in 2016. This reflects better year-to-date figures in the top six markets for U.S.-manufactured goods. The U.S. dollar has fallen 2.6 percent so far in 2018 against major currencies, according to the Federal Reserve, or 11.0 percent since the end of 2016, helping to improve international demand for U.S.-manufactured goods. Yet, despite the positive news for manufacturers, the U.S. trade deficit rose in December to the highest level since October 2008. Beyond that headline, however, goods exports, petroleum exports, service-sector exports and goods imports rose to all-time highs, highlighting the increase in global trade of late. As the NAM explained in public comments submitted to the Trump administration in May 2017, many factors impact and cause changes in the U.S. trade deficit over time. These factors include overall domestic conditions and standards of living, domestic consumption and purchasing compared with savings rates and the price of goods in the market. The latter, in turn, is impacted by exchange rates, domestic structural issues (e.g., taxation and regulation) and openness to international trade. Furthermore, when U.S. economic activity and consumption have grown, the trade deficit has typically expanded. Conversely, when U.S. economic growth has slowed, the trade deficit has shrunk. Meanwhile, net hiring among manufacturers remained solid in December, according to the latest Job Openings and Labor Turnover Survey (JOLTS) report. The manufacturing sector hired 352,000 workers in December, up from 343,000 in November and not far from August’s level of 359,000, which was nearly a 10-year high. Hiring increased for durable goods firms in December, up from 196,000 to 205,000, but was unchanged for nondurable goods manufacturers at 147,000. At the same time, total separations —including layoffs, quits and retirements—rose from 317,000 to 329,000, an 8-year high. As a result, net hiring (or hires minus separations) declined from 26,000 in November to 23,000 in December. More importantly, though, net hiring has averaged a very healthy 31,500 over the past five months, or 18,500 in 2017. That suggests that the labor market in manufacturing has been quite robust, especially as the economic outlook has strengthened. Nonetheless, manufacturing job openings decelerated at year’s end, down from 404,000 in November to 364,000 in December. It was the first reading for job postings below 600,000 since May. Nonetheless, it is clear that the pace of job openings has picked up overall. Monthly job openings in the sector averaged 393,667 in 2017, up from 341,750 in 2016. Moving forward in 2018, we anticipate renewed strength for job openings in the coming months. There will be a number of economic updates this week on consumer, housing and manufacturing activity, with each expected to show continued modest growth. For manufacturers, production in the sector edged up 0.1 percent in December, with year-over-year growth of 2.4 percent. We anticipate industrial production figures for January will extend those gains. Consumer spending was a significant driver of growth at year’s end, with retail sales up 0.4 percent in December and a whopping 5.4 percent over the previous 12 months. In contrast to those data points, the housing market disappointed for much of 2017, even while homebuilders remain very upbeat in their outlook. Housing starts were lower in December and fell 6.0 percent year-over-year. Yet, housing permits remained above 1.3 million units, which would indicate optimism for accelerated activity moving forward. Other highlights this week include manufacturing surveys from the New York and Philadelphia Federal Reserve Banks and updates on consumer confidence, consumer and producer prices and small business optimism. The Federal Reserve Board reported that U.S. consumer credit outstanding rose 5.8 percent at the annual rate in December, slowing from the robust 9.8 percent gain in November but still a healthy increase. Total consumer credit was $3.841 trillion in December, with $1.028 trillion in revolving credit and $2.813 trillion in nonrevolving credit. Across the past 12 months, consumer credit has increased 5.4 percent, with revolving and nonrevolving credit up 6.0 percent and 5.1 percent year-over-year, respectively. Revolving credit, which includes credit cards and other credit lines, was up 6.0 percent in December. While this is a decent figure, it represents a pullback from the 9.9 percent and 13.1 percent growth rates experienced in October and November, respectively. In general, Americans have been less cautious in their spending and more willing to use their credit cards for purchases, as seen in recent savings rate data. Meanwhile, nonrevolving credit, which includes auto and student loans, also decelerated, down from 8.6 percent growth in November to 5.7 percent in December. The Bureau of Economic Analysis and the Census Bureau reported that the U.S. trade deficit rose from $50.44 billion in November to $53.12 billion in December, its highest level since October 2008. While that headline will likely make news, it is important to note that overall trade volumes have risen significantly over the past couple of months, with goods exports up from $134.07 billion to $137.47 billion and imports up from $204.85 billion to $210.82 billion. In a similar way, service-sector exports (up from $65.74 billion to $65.88 billion) also rose to the highest level on record, even as the service-sector trade surplus edged down from $20.35 billion to $20.23 billion. More importantly for manufacturers, exports rebounded strongly in 2017—a nice turnaround after global economic weaknesses in both 2015 and 2016. U.S.-manufactured goods exports totaled $1,094.73 billion in 2017, up 4.34 percent from $1,049.24 billion in 2016. This reflects better year-to-date figures in the top six markets for U.S.-manufactured goods: Canada (up from $266.80 billion to $282.39 billion), Mexico (up from $229.70 billion to $242.99 billion), China (up from $115.60 billion to $130.37 billion), Japan (up from $63.24 billion to $67.70 billion), the United Kingdom (down from $55.29 billion to $56.33 billion) and Germany (up from $49.36 billion to $53.49 billion). As noted above, the underlying goods exports data were mostly higher, led by increased exports for industrial supplies and materials (up $1.55 billion), non-automotive capital goods (up $1.16 billion), other goods (up $517 million) and foods, feeds and beverages (up $448 million). This was partially offset by declines in consumer goods (down $208 million) and automotive vehicles and parts (down $75 million). At the same time, the major categories for goods imports were up across the board, with the largest gains for consumer goods (up $3.21 billion), automotive vehicles and parts (up $1.06 billion), non-automotive capital goods (up $837 million) and industrial supplies and materials (up $567 million). Interestingly, the trade deficit stemmed largely from non-petroleum sources. The petroleum trade deficit dropped from $4.55 billion in November to $3.28 billion in December. In addition, real petroleum exports reached an all-time high in December, at $11.06 billion. As the NAM explained in public comments submitted to the Trump administration in May 2017, many factors impact and cause changes in the U.S. trade deficit over time. These factors include overall domestic conditions and standards of living, domestic consumption and purchasing compared with savings rates and the price of goods in the market. The latter, in turn, is impacted by exchange rates, domestic structural issues (e.g., taxation and regulation) and openness to international trade. Furthermore, when U.S. economic activity and consumption have grown, the trade deficit has typically expanded. Conversely, when U.S. economic growth has slowed, the trade deficit has shrunk. The Bureau of Labor Statistics reported that net hiring among manufacturers remained solid in December, according to the latest Job Openings and Labor Turnover Survey (JOLTS) report. The manufacturing sector hired 352,000 workers in December, up from 343,000 in November and not far from August’s level of 359,000, which was nearly a 10-year high. Hiring increased for durable goods firms in December, up from 196,000 to 205,000, but was unchanged for nondurable goods manufacturers at 147,000. At the same time, total separations—including layoffs, quits and retirements—rose from 317,000 to 329,000, an 8-year high. As a result, net hiring (or hires minus separations) declined from 26,000 in November to 23,000 in December. More importantly, though, net hiring has averaged a very healthy 31,500 over the past five months, or 18,500 in 2017. That suggests that the labor market in manufacturing has been quite robust, especially as the economic outlook has strengthened. Nonetheless, manufacturing job openings decelerated at year’s end, down from 404,000 in November to 364,000 in December. It was the first reading for job postings below 600,000 since May. Nonetheless, it is clear that the pace of job openings has picked up overall. Monthly job openings in the sector averaged 393,667 in 2017, up from 341,750 in 2016. The underlying job openings data in December were lower for both durable (down 248,000 to 228,000) and nondurable (down from 156,000 to 136,000) goods businesses. Moving forward in 2018, we anticipate renewed strength for job openings in the coming months. Turning to the larger economy, job openings for nonfarm payroll businesses slipped from 5,978,000 in November to 5,811,000 in December, its lowest level since May, mirroring the manufacturing data. It was the third consecutive month with job postings below 6 million, with total job openings pulling back from the all-time high recorded in July (6,140,000). In the latest data, sectors with increased job openings in December included education and health services, financial activities, government, information, leisure and hospitality, mining and logging and wholesale trade. Meanwhile, net hiring among nonfarm businesses continued to be healthy, at 281,000 and 250,000 in November and December, respectively.